Both Athens-Clarke County and Barrow County also experienced growth in their SPLOST tax revenues in December compared with a year earlier, but the Oconee County growth rate was considerably larger, and the average growth rate for Oconee County over the last 12 months greatly exceeds the growth rate during that same period in the two neighboring counties. Oconee County continues to be the smallest of the three counties in terms of retail sales, with Oconee County’s $653,483 in December SPLOST revenue lower than the $805,121 collected in Barrow and the $2,152,597 collected in Athens-Clarke County. The Georgia Department of Revenue distributed December revenue from the 1 percent SPLOST at the end of January, as distributions lag collections by a month. SPLOST distributions are a good sign of commercial activities, as the tax is imposed on food as well as other consumer goods. Oconee County has double digit growth rates, comparing one month with the same month a year earlier, in nine of the last 12 months, with the February 2013 to February of 2014 growth rate the largest at 21.5 percent. 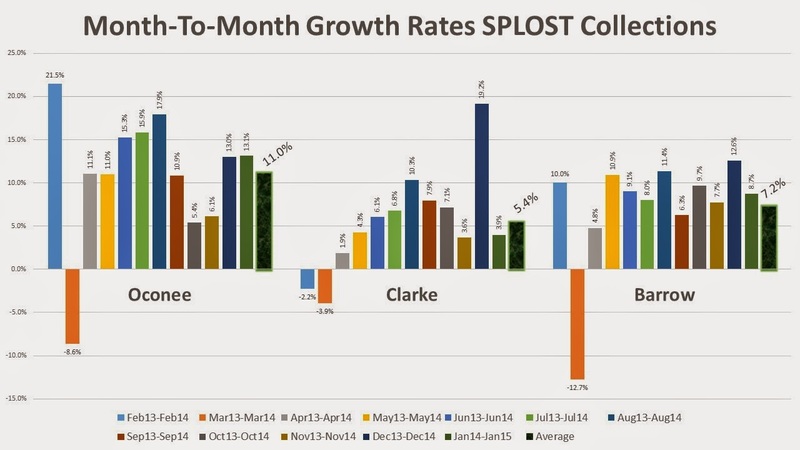 Oconee County had negative growth in March and modest growth in October and November. It is more difficult for Athens-Clarke County to achieve large growth rates because of the size of the base. Athens-Clarke County received $153,402 more in SPLOST revenue in January 2015 (for December 2014 sales) than in January of 2014, but that translated to a gain of only 3.9 percent. Oconee County recorded a gain of $69,435 in the January to January comparison, producing the growth rate of 13.1 percent. Athens-Clarke County received 19.2 percent more in SPLOST revenue in December 2014 disbursements (for November) than it did in 2013. The University of Georgia had three home football games in November of 2014, including for Auburn and Georgia Tech. It also had a nonconference game with Charleston Southern. In 2013, UGA had only two home football games in November, with Kentucky and with Appalachian State. Barrow County shares the traffic corridors to Athens-Clarke County with Oconee County, and it had an increase of 8.7 percent in SPLOST revenue in January of 2015 (for December 2014) compared with a year earlier. Barrow’s growth rate in December (for November) nearly matched that of Oconee County, at 12.6 percent. Barrow also has a larger base on which the growth rate is computed, meaning that Barrow has to grow more than Oconee to produce the same growth rate. In the January disbursements, Barrow County had $80,172 more in SPLOST revenue than it did in the same month in 2014. At the planning session the Oconee County Board of Commissioners held in Athens-Clarke County on Jan. 22, Finance Director Wes Geddings confirmed that the county expects to receive only 84 percent of the revenue projected from the 2009 SPLOST, which expires at the end of September. The county had assumed from the start that the $40.4 million projection was overly optimistic and had withheld 20 percent of allocations in internal planning budgets. The county officially has projected that SPLOST 2015, which was approved by voters in November and will begin on Oct. 1 of this year, will bring in $55.6 million. Geddings told the commissioners on Jan. 22 that his actual projection is that the tax will bring in only 85 percent of that amount. The county will budget based on that estimate, he said. Though this was not discussed in the public meetings on SPLOST last year, County Attorney Daniel Haygood told the commissioners on Jan. 22 that they want to project beyond what they actually expect the tax to produce so that the tax does not expire. A high projection has two additional advantages not mentioned by Haygood at the planning meeting. Haygood told the county last year it could reallocate funds in the current SPLOST as long as no category of funding was given no monies since the tax was producing less money than projected. The county did just that. A higher projection also allowed the commissioners to add more projects to the SPLOST list of things to be funded, thus making the package more attractive to voters. The county is heavily dependent on SPLOST revenues to fund a long list of projects, including water and sewer infrastructure, road construction, and recreational projects. In addition, the county now gets 52 percent of its General Fund revenue from another 1 percent Local Option Sales Tax, or LOST. LOST and SPLOST both apply to food, but the two taxes are not identical in all ways. In the January disbursement, LOST produced $576,505, compared with the $653,483 for SPLOST. The two county sales taxes are combined with the 1 percent tax for the Board of Education and a 4 percent state tax, and many voters likely are unaware of how the 7 percent tax they pay at the cash register breaks down. The commissioners have preferred to push development to generate additional sales tax revenue rather than increase property taxes or fees to cover projects they want to fund. Last year, the commissioners approved a widening of Jimmy Daniell Road as a way of opening up more commercial development in that corridor between SR 316 and Atlanta Highway. They also are considering widening Daniells Bridge Road and constructing an extension of Daniells Bridge Road with a flyover of SR Loop 10 to Home Depot to open up additional land for development behind the shopping center containing Trader Joe’s. In addition, they already have spent money on design work for an extension of Parkway Boulevard to connect the roadway in front of Kohl’s with the Oconee Connector at Epps Bridge Centre. At the meeting on Sept. 22, B.R. White, director of planning for Oconee County, presented a plan to create an overlay district along Mars Hill Road, now undergoing widening from Butler’s Crossing to SR 316. White said the goal would be to standardize regulations for what is anticipated to be extensive commercial development along the corridor once construction is completed. The county’s Industrial Development Authority is engaged in a similar plan to create standardized zoning along a band of land on each side of U.S. 78 and SR 316 as they pass through the county. The goal is to stimulate commercial and industrial growth along these routes. Some of the growth in SPLOST and LOST tax revenue in Oconee County almost certainly has come about at the expense of Athens-Clarke County. While consumers likely shifted some purchasing from existing Oconee County retailers to those in Epps Bridge Centre after it opened at the end of the summer in 2013, they also are likely to have shifted from Athens-Clarke County stores to those in the new mall. A number of stores actually moved from locations along the Atlanta Highway in Athens-Clarke County to Epps Bridge Centre, and others are planning to do so in the future. Athens Promenade has lost and is losing most of its major retailers. That shopping center, just inside Loop 10 on Atlanta Highway, was built in 2000, showing how quickly retail space can become vacant in the competitive retail market that also is under increasing pressure from online distributors. The Georgia Department of Revenue does not release to the public or the county records indicating the source of the sales tax revenues it distributes, making it impossible to see precisely who is contributing to the shifts in tax revenues in the two counties. It is even possible that some taxes collected by retailers in Oconee County end up in Athens-Clarke County. Many of the retailers in Oconee County have Athens postal addresses. Geddings acknowledged this problem in his comments before the BOC on Sept. 22.